Description: Chicago Burlington & Quincy Railroad E5 9911A, named SILVER PILOT, at Galesburg, Illinois, date and photographer unknoen, print by J. M. Gruber, Chuck Zeiler collection. The locomotives display the complete truck skirts, so that roughs in the date as early 1940's. Note the kerosene lamp mounted on a spring in the right foreground. Description: Chicago Burlington & Quincy Railroad E5 9911A, named Silver Pilot, at Galesburg, Illinois on August 28, 1948, photographer unknown, print by William A. Raia, Chuck Zeiler collection. My best guess is that this train was the Nebraska Zephyr. Description: Chicago Burlington & Quincy Railroad E5 9911A, named Silver Pilot ( named removed in the early 1950's ), at Fort Worth, Texas on January 30, 1955, photograph by R. S. Plummer, print by Gordon C. Bassett, Chuck Zeiler collection. This unit became FW&D 9982A on June 1, 1955, and C&S 9952A on October 1, 1955. 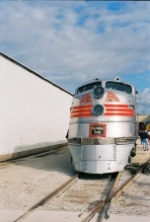 It eventually made its way to the Illinois Railway Museum. My best guess is the train was the Texas Zephyr. Description: Burlington Northern Railroad GP38M 2168 at Springfield, Missouri on January 6, 1994, Kodachrome by Chuck Zeiler. While not a very good photo of 2168, seen in the background is Illinois Railway Museum's ex-CB&Q E5 9911A on its way to Fort Worth, Texas, for the introduction ceremony of BN's new SD70's. On the way, it stopped at Springfield for wheel truing work in the former SLSF Shops, now gone. Note on the left the turntable placed on an incline at surface level. Description: Ex-Chicago Burlington & Quincy Railroad E5 9911A at Springfield, Missouri on January 6, 1994, Kodachrome by Chuck Zeiler. Number 9911A was loaned by the Illinois Railway Museum to the BN for display at the debut ceremony of the new SD70MAC's in Fort Worth, Texas. On the way to Fort Worth, the E5 stopped at the former SLSF shops in Springfield for some wheel truing work. It is seen here as it was released from the shops. After being coupled to the passenger trainset (also from IRM) and with EMDX GP38-2 753 leading (for collision protection), the E5 and train will head for Fort Worth. It was rumored that somewhere between Springfield and Fort Worth, The E5 powered the train, meeting or perhaps exceeding the speed limit. Description: Ex - Chicago Burlington & Quincy Railroad E5 9911A at Springfield, Missouri on January 6, 1994, Kodachrome by Chuck Zeiler. Number 9911A was on loan from the Illinois Railway Museum and stopped at the former SLSF shops in Springfield for some wheel truing work. Here it is seen being pulled from the shops after a couple of days work. It will be reunited with the ex-Nebraska Zephyr trainset, and with leased EMDX GP38 753 leading (for collision protection) depart for Fort Worth, Texas and an appearance at the debut of the BNSF's SD70MAC locomotives. Another interesting thing in this photo is the turntable in the background. I don't know the history, but apparently either the Frisco or the BNSF decided that a surface (rather than a pit) was the better plan. Description: EMDX GP38-2 753 at Springfield, Missouri on January 6, 1994, Kodachrome by Chuck Zeiler. This was a ferry move to bring the Illinois Railway Museum's CB&Q 9911A and Nebraska Zephyr trainset from Union, Illinois to Fort Worth, Texas for participation in BN's preview ceremony of its new SD70MAC locomotives. Number 753 was on the point for collision protection. Description: CB&Q 9911A is returning from Fort Worthless Texas. Title: The rules for railroads havent changed much either. Title: Heavy rainstorm will not slow her down. Description: CBQ 9911-A is on display at the Illinois Railway Museum at Union, IL. Description: Old photo scan: The Nebraska Zephyr parked on station track 2 waiting for servicing in barn 2. Description: Old photo scan: #9911-A with a string of commuter coaches. Description: This EMD E5A is kept under roof at IRM. It still pulls excursion trains today. Description: The Nebraska Zephyr and CNW Bilevels rest between trips on the mainline. Description: The Nebraska Zephyr's power unit, Silver Pilot, stands at Union.